There are many places where you can go quad biking starting from 1 hour to a full day however don’t expect the desert in Marrakech. The best you can hope for is rough terrain, river and scenic berber villages however if you willing to travel 600 Km in the direction to Merzouga South of Marrakech you will find a true desert. Let’s stay in Marrakech!!! 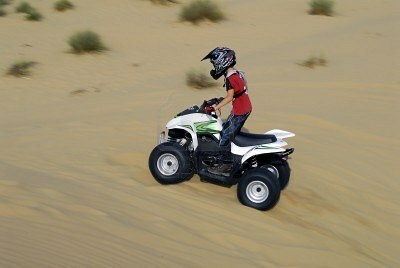 – Even not the same there’s a fantastic quad bike track in the Palmeraie, 15 mins by taxi from the medina. It’s run by Nomade Quad. They organizes hiking tours, camel raids and Quad biking. Quad Nomad is managed by professionals and they have extensive experience organizing tours meratol for visitors. You may need to book in advanced, and they’ll come and pick you up from your accommodation for no additional charge. You can also ride quad bikes at Lalla Takerkoust, 35km from Marrakech, where there’s a dam with a huge reservoir with other water sports available in an area that have perfect trails for walking, mountain/quad biking and horse riding. If you plan to visit Essaouira you must go to Palmaquad, here you will be well looked after safety wise and also you will be riding some massive sand dunes right next to the Atlantic Ocean, on nearly new bikes and the prices are cheaper than in Marrakech. About Us | Links | Contact us | Log in | Entries (RSS) | Comments (RSS) 55 queries. 0.582 seconds.